Naturally inhabits deep water areas upto at least 100 metres where there is very little light. For this reason, dhonti will be more active in the aquarium in lower light conditions or in tanks where plenty of cover is available. 16″ (40cm), although usually much smaller in aquaria. Should be housed in a Lake Tanganyika biotope setup, with piles of rocks arranged to form caves and areas of open water for swimming. Dim lighting will encourage the fish to be seen more often; otherwise ensure there is plenty of cover for these fish in the form of rocky areas and caves as previously mentioned. Should not be kept with any fish so small as to be considered food but makes a good addition to a community of larger hard water cichlids, ideally of Tanganyikan origin. It is territorial with conspecifics and a group would require a suitably large tank. Adult females are plumper than males. It can also be sexed by examining the genital papillae. This is not for the amateur however. The fish should be held ventral side up in the palm of your hand. The dorsal fin should be taken between your middle and ring fingers in order to avoid being pierced by the sharp dorsal fin rays. The genital area you are looking for is concealed beneath the pelvic fins. This can be exposed by pulling (gently) on the caudal fin. 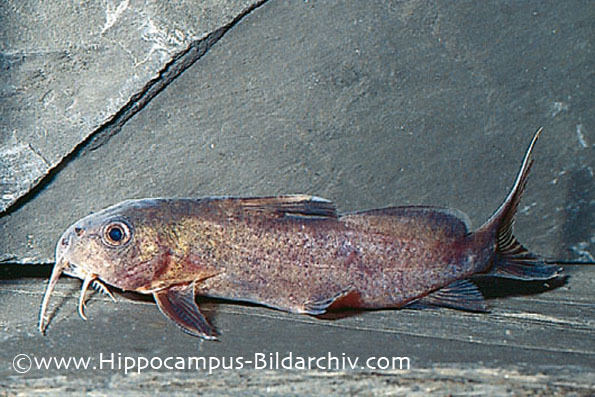 A male fish will exhibit an extended papillae which should be pointed and ridged. The spermatoduct can be seen on the caudal side. Females also have a clearly visible papillae but this is more rounded and the oviduct is on the opposite side to the male’s spermatoduct. Not recorded in aquaria. It is known to spawn in open water in nature and is an egg scatterer exhibiting no parental care. S. dhonti‘s natural deep water habitat and solitary lifestyle make collection for the hobby difficult and so it is rarely seen for sale. When juvenile it may be confused with other Tanganyikan Synos but it loses its spotted patterning as it matures.